This versatile labret jewelry can be worn for a variety of piercings that will fit a 5/16” length post. 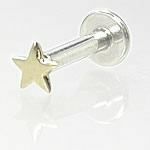 The 14g shaft is made from implant grade stainless steel while the 2.75mm flat star top is 14kt white gold. The post features a UFO rounded back disc with a 5mm diameter, providing more than enough room for comfortable wear. This piece has internal 1.2mm threading, which is compatible with our other standard 14-12g posts and tops.